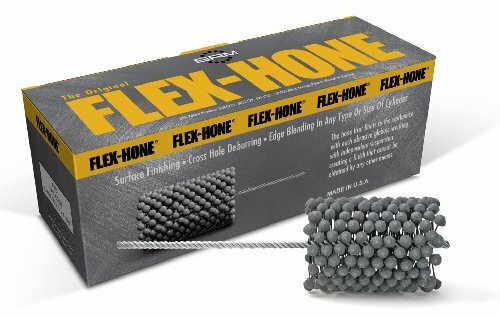 Size: -- Choose Size -- 3" 3-1/2" 3-1/4" 3-3/4" 4" 4-1/2" 4-1/4" 5" 5-1/2" 6" 6-1/2" 7" 7-1/2" 8"
Flex-Hone GBD-series abrasive bead style brushes for block cylinders or liners have globe-shaped abrasive points on an independent suspension for self-centering, self-aligning to the bore, and self-compensating for wear. This reduces set-up time and costs and the need for special operator training, as well as ensuring precise control of finish parameters. The resilient, flexible honing tool has a soft cutting action to create a plateau finish, where surface irregularities are reduced, while retaining a cross-hatch suitable for oil retention; the plateau finish increases the bearing area of the surface. Order by actual bore size as the tool is produced oversized. Using the Flex-Hone low-temperature abrading process exposes undisturbed base metal, to help produce a long-wearing surface by removing cut, torn, and folded metal. The final surface of the metal part is optically smooth and has significantly reduced fragmented, amorphous, or smeared metal from previous operations. Cylinder hones are suitable for use deglazing, surface finishing, and deburring on cylinders, as well as cross hole deburring, port radiusing, and edge blending on items such as firearm chambers, musical instruments, combustion chambers, air compressors, pumps, valve bodies, valve guides, and brake cylinders. Use by hand or in NC/CNC equipment. NC-style tools can be used on both the older Numerical Control (NC) machines, which are programmed using physical media such as magnetic tape, and the newer CNC (Computer Numerical Control) machines, which are programmed using computers. 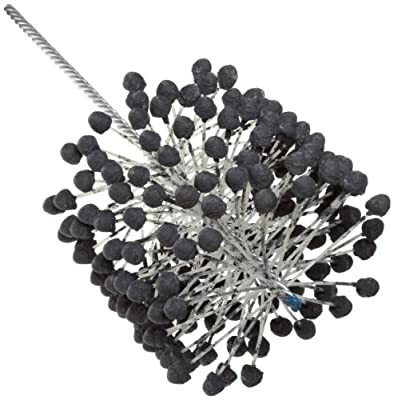 Abrasives are used for a variety of applications from shaping a part to fine finishing, depending on the grit size. Low grit numbers like 40 are coarse and are used for removing excess material and shaping a part. High grit numbers like 400 are fine and help to create a smooth surface finish. Silicon carbide is a sharp, aggressive grain that offers high penetration, fast cutting, and high material removal even under light pressure. It is commonly used with softer materials like brass, plastics, and rubber, and abrasive materials like glass and enamel, but can wear out faster than aluminum oxide when used on wood. Brush Research Manufacturing Co., headquartered in Los Angeles, manufactures tools in the United States, and has been in operation since 1958. The company specializes in ball hone abrasives and industrial brushes for honing, a type of precision surface finishing. Brush Research meets ISO 9000 certification for quality.